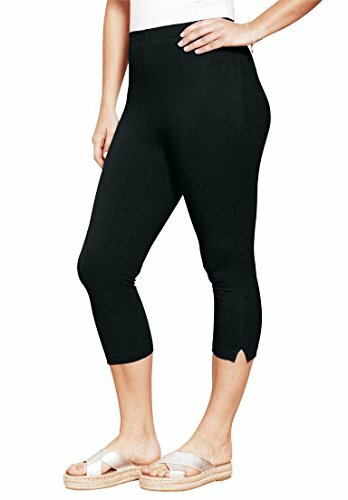 Part of our essential knit legging collection, these plus size leggings are a wardrobe staple. elastic waist flatters the waist for a beautifully smooth figure side slit at hem allows you to move with ease inseam about 16" and meets you below the knees for the perfect capri length fits height 4'11" to 5'3 1/2" cotton/spandex machine wash imported Plus size leggings, pants - stretch knit capri legging, sizes S (12W), M (14W-16W), L (18W-20W), 1X (22W-24W), 2X (26W-28W), 3X (30W-32W), 4X (34W-36W), 5X (38W-40W) In Style Now! These leggings are the perfect addition to this season's wardrobe! They give you the coverage and style you love. You'll look as fabulous as you feel.